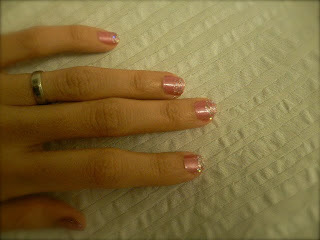 So, today I tried doing DIY manicure, with a fancier touch...LOL! 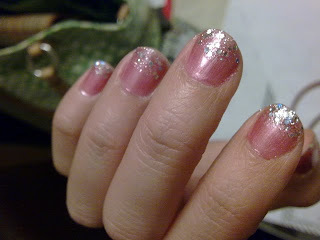 Yeah, I actually had this 'look' professionally done in Singapore for my bro-in-law's wedding, it was my own customized design...hehe.....I like it, coz I think it adds shimmers without actually using the faux crystals which cost a bomb on a pair of hands!! !